DiscountMags.com is back with another really fantastic Valentine’s Day Magazine Sale and if you are doing any Valentine’s Day shopping don’t forget: magazines make great gifts! You can even send an e-Valentine’s Day card to announce your gift! This huge magazine sale is a great opportunity to get a deal on your favorite magazine subscriptions at some of the lowest prices of the year. There are over 100+ titles to choose from. Go here to see them all! Also, remember that you can use these low sale prices to RENEW your existing subscriptions as well! You can purchase magazine subscriptions as gifts, for yourself or even to renew existing subscriptions. No coupon codes needed. This sale will end February 12th, 2018, at midnight EST. Looking for Valentine’s Day gifts for the kids? 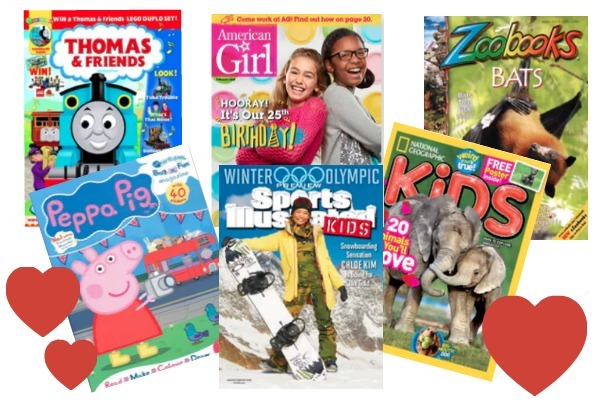 Don’t forget to check out this awesome Valentine’s Day Magazine Sale for kids!! Some great prices and what a wonderful way to give the gift that gives all year long! No coupon codes needed, this sale ends February 14th, 2019, at midnight EST.